This will be their last networking event of the year. Guest speaker Michelle Downey is head of thebestof and a local business marketing expert. Michelle will offer her top tips on how small to medium sized enterprises can promote their businesses effectively. Elaine Carr, owner of the bestof Haverhill, said: “After nine years of working with bestof franchises across the country Michelle has a vast amount of experience of the marketing that works best at a local level. She is a passionate and accomplished speaker with a reputation for leaving her audience enthused. A number of bestof Haverhill business members will also be exhibiting and demonstrating their products and services at the event with a “mini expo”. Local accountant Paul Donno from 1 Accounts Online will be showcasing Sage One, the award winning online accounts software and service that enables small businesses to access their accounts online, anytime, anywhere - provided there is an internet connection. Katie Ditchman from Perform Sports Therapy has recently qualified as a medical acupuncture practitioner and will be available to explain the benefits of this complementary medicine for the treatment of injuries. Local printers Red Side Up will be on hand to answer any questions you may have on print and will have samples of a selection of their extensive range of printed material and promotional goods. They are also taking the opportunity to demonstrate their new website at the event. The website, which will be launched later this month will enable the visitor to design documents, such as business cards and flyers, online using simple user friendly templates, check prices and order online 24/7. The event is free to attend for all local businesses however you must pre-register by emailing Sophie Allen at sophie.allen@thebestof.co.uk by 5pm on Tuesday 18th November. 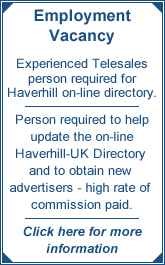 If you would like to find out more about the bestof please visit www.thebestof.co.uk/haverhill.